Go for Gold is an incentive based scheme developed to encourage children and their parents to use sustainable travel modes for the school journey. This can include walking, Crocodile Trail (walking bus), scooting, cycling, using the bus, train, park & walk and even car share as it’s reducing the number of cars on the school journey. Children are issued with a ‘passport’ which is stamped each time they make a sustainable journey to school. Certificates and stickers are awarded along the way. Once they have completed a passport they can redeem this for one of many free activities that Buckinghamshire County Council have negotiated with a number of leisure centres throughout Buckinghamshire. These include swimming, bowling and golf. Certificates and/or incentives can be awarded in either class or assembly. Schools can choose to source their own incentive materials, although Transport for Buckinghamshire can offer some at a minimal cost which can be ordered using the incentives order form below. Go for Gold achieved international recognition when it was awarded the first International Walk to School Award in March 2004. 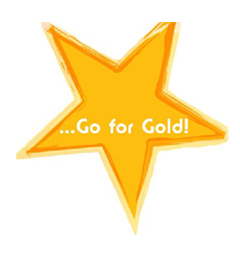 If your school already runs Go for Gold, you could support the Co-ordinator by offering to stamp passports or help with promotional events. If your school doesn’t run Go for Gold, you could become the Co-ordinator. You can organise the ordering and stamping of passports, arrange to present certificates in assembly and set up some promotional activities to motivate the children to join in. Just download the Guidelines to find out more.